Microphone selection has a huge impact on the quality of captured sound. Through the ever continuing years of learning, it was always drilled into me that the relative positioning of the microphone was paramount (and it is!) but selecting the right microphone for the job is even more important. Filming next to a major road can be a real problem, as the sound of the traffic can just over power the dialogue. A great example I've recorded this morning - (for some form of visual perspective this is a single carriage A road in the country side, 40mph limit, quite windy morning) - on a reporters style stick mic and a conventional tie clip / lavalier. When I made the recording, it was originally to a split stereo file with the stick mic panned left, and the lavalier panned right - the files below are now mono files from each microphone. The stick mic was held in the usual "reporters" position, and the lavallier was positioned outside of my clothes, just with the conventional Tram wind cover on. And it is amazing just how much difference there is between a dynamic microphone (in this case a Beyerdynamic M58) and a tie clip mic (in this case a Tram TR50 via a micron explorer) in this location. 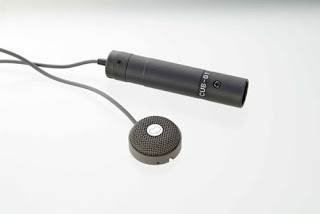 It makes complete sense from the design of the microphones, and it really shows the effects of suiting the microphone to the application and environment. The downside is whether having a stick mic in shot is suitable to the production...let's be frank its not something you'd use in a drama...but for news reports, some interviews and some corporates, it's ideal. Another related incident I had recently was when filming two characters shouting at each other through a closed doorway. We started by using the usual selection of boom mic - but the sound was really awful, due to the early reflections off of the closed door, making it sound incredibly phasey. As soon as we used a boundary microphone on the door itself (nicely mounted out of shot), the step change was really incredible. Even just having a simple selection of microphone types can dramatically improve the quality of the captured sound - the art is in listening, and knowing when the sound can be improved by taking a different approach that will be acceptable to the production.